·Large vibrating range and the amplitude up to 8mm for the weak sticky materials hanging on the fork. ·Adjustable amplitude for distinguishing from the density of different substances. ·Ultra red LED offers a immediate warming for the operator to control the measurement. ·Flexible AC, DC power input makes not only less inventory but broad application. ·Various output modes, flexible use. 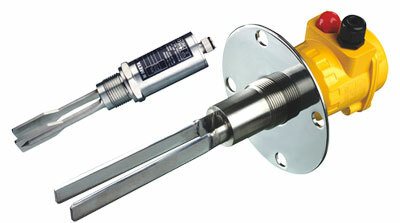 ·Suitable for measurement of level of liquid, particulate and dense materials. ·Available to detect solid substances in liquid. 07 Series Fork Level Limit Sw.